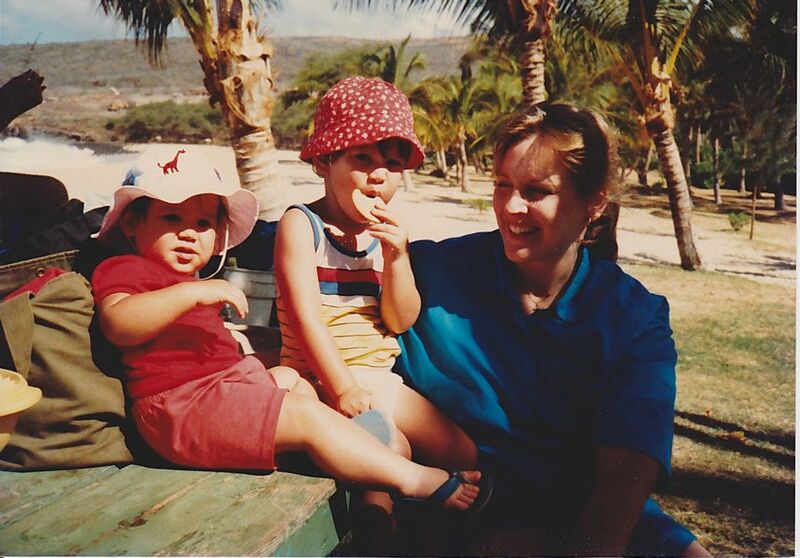 Danni Komatsu with her two oldest sons, Van Michael and Rocky, at Manele Bay on the island of Lanai. She retreated to the refuge of her bedroom that afternoon. This didn’t happen often. Curious, I crept toward the shut door. Then I heard it. She was weeping. I was a young boy, probably about 9 or 10, so I don’t remember all that happened that day except us kids being particularly difficult. Putting the pieces together years later, I suppose that our apathy and absence of compassion for the well-being of our mother, displayed through our collective, persistent disobedience, triggered an eruption of grief and frustration. I heard her weeping. She eventually came out of her room that day, by God’s grace, and she persevered. Her name is Danni Komatsu. I’m grateful to call this beautiful woman my mom. She is, along with other moms like her, worthy of public tribute. My hero is a homemaker. Perhaps yours is, too. Here are some honorable qualities that come to mind as I consider my mom in her steadfast patience, sustaining faith, and sacrificial service. Many of us kids were shamelessly lazy (*ahem* Rocky, Kenny, myself *ahem*). An endless number of times she kindly requested our completion of menial chores. We were parentally disciplined, but mom never yelled at us. I know she isn’t perfect, but, without hyperbole and with complete honesty, I cannot recall a single outburst of rage catapulted in our direction. Even at the pinnacle of her emotional boiling point, she went behind closed doors, choosing to pour her heart out before her Father rather than pour her wrath out against her children. She raised, schooled, endured, and enjoyed seven kids—seven messy, loud, lazy, hungry, hyperactive, needy, expensive, unregenerate kids. She never gave up, never blew up, and never left us. Her gospel love wouldn’t give up. The grace that was gifted to her is the grace that gushed from her, soaking us in a shower of undeserved patience, endurance, and longsuffering. My mom never gave me a lecture on the finer points of systematic theology or the intricacies of biblical exegesis. But she sang, and she prayed, and she hoped, and she trusted. She quoted Proverbs and she loved Jesus. I intuitively knew that this Jesus of Nazareth was the sustaining obsession of her existence, as she exemplified a rock-solid faith in the sufficiency of his saving person and work and consequently clung to him with reckless abandon. Her sustaining faith birthed steadfast prayer. She prayed for us at bedtime. I saw her standing silhouetted at my door, night in and night out, in motherly care. On countless nights we fell asleep to the comforting sound of our mother’s prayers. I recall her self-giving sacrifice. I see her hands and feet. Back then I didn’t think anything significant about them, calloused as they were from years of scrubbing, washing, vacuuming, bending, lifting, kneeling, cooking, weeding, and planting. She didn’t have the luxury of regular pedicures or manicures, but her hands and feet radiated with the virtuous beauty of self-sacrifice. I hear the melodic, familiar chime of her bracelets at the crack of dawn as she lovingly prepares breakfast and I’m greeted with aromatic wafts of homemade cinnamon rolls, banana pancakes, breakfast fried rice (we’re Asian like that), and eggs in a nest. I read her handwritten cards, etched in her unique cursive longhand. She’s the kind of mom who sends encouragement-filled notes to her single son on Valentines Day (and multiple other holidays), year in and year out, even when he’s well into his 20s. I see her sacrifice displayed in lifestyle simplicity. It’s true that there’s no inherent nobility in material simplicity, and a man is not necessarily more spiritual because he drives a ’94 Corolla and his neighbor drives a ‘14 Charger SRT. But in her case, the intentional choice of birthing and raising a large, busting-at-the-seams family necessarily meant the sacrifice of a more comfortable lifestyle, even when many chose a life beyond their means or shirked motherhood altogether for self-serving gains. Subtract that small Komatsu army to feed, and mom and dad could’ve had filet mignon or something fancy like that, stacks on stacks on stacks of it. I remember the simple life, which now I wouldn’t trade for anything—the cousin-bestowed hand-me-downs, the yard-grown produce, the ‘my-muffler-has-a-problem-that-everyone-needs-to-know-about’ Volkswagen van (succeeded by the rust-encrusted station wagon), the cloth diapers, the embarrassing Payless off-brand Shaq shoes, and the powdered milk—oh, the powdered milk, stacks on stacks on stacks. My mom’s not materially flashy. She does enjoy jewelry and dressing up and looking pretty. But she has sacrificed a material opulence that many consider primary because some things are more important than having super nice clothes, or always-secure checking accounts, or regular spa visits. Motherhood necessarily involves personal sacrifice and self-giving service. My mom embraced that sacrifice with unceasing joy. My hero is a homemaker. Copyright © 2013 Van Michael Komatsu. All Rights Reserved. Ahhh I wanna be a mom like Auntie Danni! This has convicted me in so many areas I need to work on. We met your mom and she is someone who is truly special. Thanks for her tribute, I read in the bible that kids are the gems in a mother’s crown and now I can’t find the verse but I see it played out in life through you Kamatsu boys which I have had the preveledge of meeting and knowing through our church. I still pray for y’all too. I know your mother from college. She was a sweet, shy, beautiful christian inside and out, a genlte smile and loved a young man who wrote her wonderful letters from afar by the name of Mike. Your lovely letter to her is like the scripture I read this morning and my husband and I were talking about, Proverbs 31. I have always enjoyed Danni’s Christmas letters about her family and Praise the Lord that now all her children walk with the Lord. This is our greatest joy as parents. I will share your letter with my husband who is working on his Sunday morning study. May you be blessed, Van Michael and thankyou for your kind words about your mom. Reading this is like reading about my own mom. A beautiful, intelligent woman who gave up so much of “life” to raise six rambunctious children (plus whoever else needed a home at the time). We took it for granted that Mom would always be there, working on her gardens so we would have food in the winter, cleaning the house and making our clothes. She was so patient and kind to us even when we set things on fire, broke her favorite dishes, broke each other’s bones and ate her contacts. (I didn’t eat her contact, just to clarify). Every day was like living in a musical because she would sing to us about how needed to be like Jesus. Sometimes the song would be an actual song and sometimes it was one she made up. This included singing in very crowded restaurants when my brothers were teenagers. I know that she has influenced so many people; young mothers who don’t know what to do, older women with her no nonsense approach to life, but especially the children. Always her heart is for the children. I really could go on and on about my mom, but I won’t. Her talents and wisdom could fill pages, but really I just wanted to thank you for writing about your mom. She sounds amazing. Women like her should be the heroes of the younger generation. It’s good to hear that she is yours. I was sent this by my daughter because it reminded her of me. This brought tears to my eyes! This is a great blog. Glad I found you! I just found your blog through Challies. Thanks for so eloquently describing the beauty of a godly mother…one of the greatest gifts God gives. Thanks for this post, Van. Found it immensely moving. Thank you! What a blessed encouragement to moms and so beautifully written!! You have been given a special gift from the Lord to communicate and connect hearts, my friend.